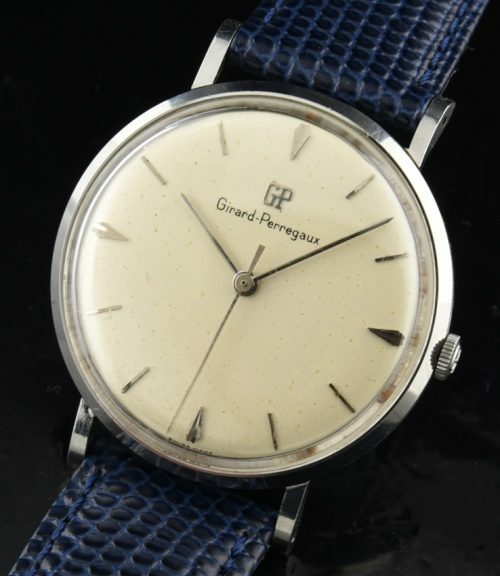 I love the original dial on this GIRARD PERREGAUX with arrow markers and needle hands! The dial has evenly aged and looks much better in person. The understated and simple design sits slimly on the wrist at only 9.5mm. with the crystal. The fine manual winding Girard Perregaux movement was cleaned and is accurate. The 34.5mm. case has an all-dial appearance with its narrow bezel-sleek. The thin, extended lugs stretch to 41.5mm. Even the original winding crown is present.